Follow our latest news and announcements. Summer is almost over and its likely your thoughts are turning to 2017 planning. I am hosting four, half-day workshops to give you the opportunity catch up on all the latest marketing and selling skills AND devise a personal Action Plan that can be implemented as soon as you return to the office! See below for details of each course and you can attend one, two or all of them – whatever suits you and your business. They will be held in the Green Isle Hotel just off M50 where parking is FREE! Price is €80 per session and includes tea/ coffee. Lunch can be had in hotel café. Book now via Eventbrite to guarantee your place. Guaranteed - everyone will devise a practical Action Plan that can be implemented immediately! Complementary Marketing material review - bring along your marketing material and Marc will review it and make suggestions! Setting marketing strategies that work for you. How to implement marketing actions so they work – logo, advertising, direct mail, emarketing, websites, social media, and much more. Many consider writing a marketing plan to be a very time consuming and questionable exercise. Plans are often left on the shelf in the office and only consulted when either sales are below target or an updated plan is required for a board meeting. Sometimes the plan is put away and not seen again until the beginning of next year. The plan should be a short, straightforward document and not unduly complicated. The plan should be aimed at senior management executives as well as those in the marketing department. It will explain the thinking behind many of the ideas and concepts in the plan and a description of the current market-place. The marketing plan should be the blueprint for all the activities of the company for the year ahead. By concentrating on the most productive areas you will also achieve an increase in profits! If you have no plan, you cannot be sure you are going in the right direction or focussing on the issues to ensure your survival. The most important part of the plan is actually the planning process where the activities of the company are reviewed and decisions made about the future. Customers are the life-blood of a company. The plan will focus on how to attract new customers and how to keep existing customers and which customers, especially lifetime customers are worth special attention. Each marketing plan is unique. Your plan relates to your vision of the future for your customers. All relevant people should contribute to it which ensures creativity as well as ownership of the plan. 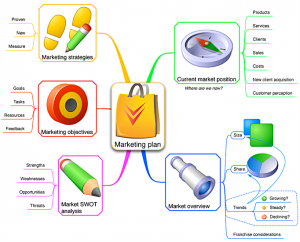 The marketing plan is part, some would say a significant part, of the company’s business plan. A company’s business plan should involve all areas of the company including manufacturing or operations, finance, personnel, information, technology, premises/property. Before the planning process for the marketing plan begins, information from senior management is required. It is advisable to obtain the “vision” or “mission statement” which the board has decided upon. If there is no such statement then the marketing department could propose a mission statement for adoption by the board. It is likely that there are corporate objectives and targets set out which will provide guidelines on what targets will need to be included in the marketing plan. Gathering information and carrying out analysis of past performance is a vital part of the planning process. The marketing department is the eyes and ears of the company and it is their role to analyse the market place, review trends from a sales and customer point of view and to share these results with other senior executives. This review and analysis is very important for other senior executives in the company so that they will have a greater understanding of the market and will be better informed. It is more likely that the proposals in the marketing plan will be approved if there is greater understanding of all the issues involved. (a)	Where are we now? (b)	Where are we going? (c)	How are we going to get there? It is important for everyone in the company to know “What business we are in”. This is known as the mission statement and is often written by the owner/entrepreneur who founded the company. The mission statement should be as broad as possible so that the company is flexible in its outlook and open to grasping opportunities in the marketplace. It should also state the company’s main competitive advantage or Unique Selling Proposition (USP). This is usually why the company started in the first place. The most important starting point is to carry out a review of “Where are we now?” This is popularly known as the SWOT Analysis: Strengths, Weaknesses, Opportunities and Threats. A company should be very critical of itself and identify its internal strengths and weaknesses. An internal strength may be your staff who are customer focused, that your products are Irish made or that you provide a “local” taxi-service, and a weakness may be that the sales staff are technical people and may lack selling skills or that you are dependent on one large customer. You should look at external opportunities in the marketplace and the threats that may affect your company now or in the near future. An opportunity for an optician might be to sell protective and sports eyewear and a threat for a local shopkeeper might be a large supermarket coming into the area. All available information on past sales performance, market research, economic indicators and market shares should be studied and included where relevant. *	To minimise some of the threats by using your strengths and turning them into opportunities. 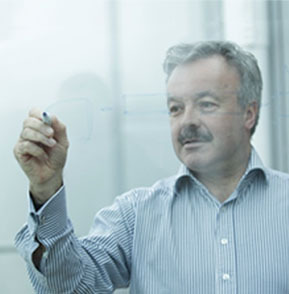 For your company these activities will be your principal objectives for the coming year. Another method of assessing the marketplace is to carry out what is often known as a PESTLE analysis or an audit of the external factors that affect the company’s performance. P.E.S.T.L.E is a mnemonic for 6 different areas or topics which can be used to assess any marketplace. The following areas or topics need to be considered and assessed for their input on your marketplace and business: – Political, Economic, Social, Technological, Legal and Environmental. Each area must be approached from the marketing perspective i.e. customer implications, sales, buyer behaviour, competitive advantage, marketing implications etc. Of course the P.E.S.T.L.E method can be applied from a corporate viewpoint and is very useful for preparatory work on the Business Plan. The political factors could include forthcoming legislation, possible European Union Directives, preferences or election promises made by the government of the day. The economic factors to be considered would include inflation, bank interest rates, levels of employment, employee incomes, taxation levels, consumer spending power, credit availability etc. The social factors include people and societal issues for example: – both parents working, working hours, cultural changes, social behaviour, use of free time, education of target market etc. There are many technological factors to be assessed including: – new technologies in one’s industry sector, use of web and internet, advancements in computers and technology to improve products and services to customers, management information systems etc. The legal situation is usually clear for each industry sector. Compliance with health and safety regulations, employment law, public liability etc are necessary. Other legal issues include labelling, tracing products, local regulations and product safety, codes of practices, advertising restrictions. A very important area for consideration from a marketing viewpoint is the environmental factors that affect the marketplace. Recycling toxic waste, caring for the environment are some of the key issues nowadays. As people are more concerned about ozone layers and their health in general, companies must also be seen to be active in these areas if they want to be attractive to broad consumer groups. The above analysis is key to the next stage of the planning process, “Where are we going?” Every company should set itself objectives and goals so that it has a focus for the year ahead and also its performance can be measured and reviewed. The objectives are identified from the SWOT Analysis e.g. organise sales training course, carry out market research on customer needs, identify targets outside your immediate catchment area. Goals are measurable targets which must be reached by the year end and usually focus on profit, growth, cash flow, new customers and new products, eg increase profits by 10%, grow sales to €250,000, increase market share from 3% to 5% of the market. You now need to identify “How are we going to get there?” For each of these objectives and goals you need to set out how they are going to be achieved. It is vital to choose the most suitable marketing strategies. There are several options outlined in the product / market matrix which may be appropriate to your business. There are 3 main marketing strategies suggested: – (1) increase market share (2) new product development (3) new target markets. It is vital for each marketing objective and goal that a suitable marketing strategies are devised and a detailed Action Plan is set out with responsibility for its completion and a deadline date agreed. For each of the strategies chosen, some parts of the marketing mix will be required. The marketing mix describes the marketing tools that are available, usually know as the Five Ps: Product, Price, Place, Promotion, People. The appropriate tool must be used to make sure that the strategy is implemented and the objective achieved. 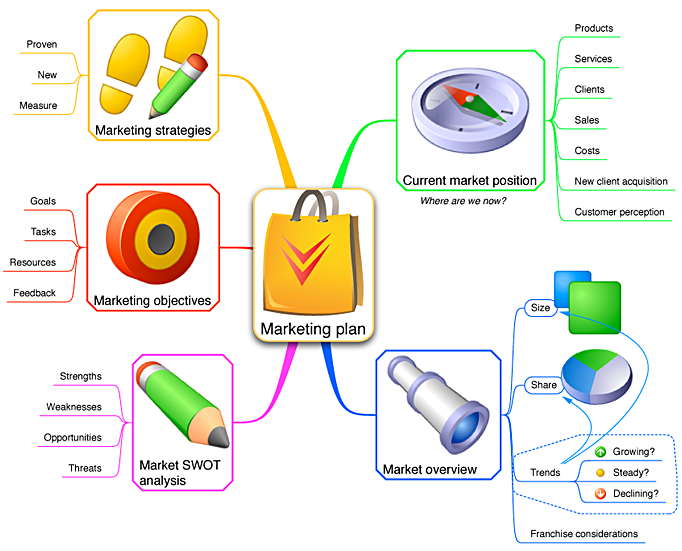 Within each part of the Marketing Mix a range of activities can be planned. At this stage most of the decisions have been made. The plan should document the specific actions for each objective/strategy. Some staff person should be allocated responsibility for each action (who does what and by which date). This accountability is vital, especially at the end of the year review of performance against the plan. The non-financial aspects of the plan should be closely monitored (quarterly at least) to ensure that the competitive strategies are working. There may be a need to revise or amend your activities. The plan is completed by allocating budgets for expenditure and sales income. Controls should be set up to ensure that performance against budget is monitored and does not get out of control without being noticed. Frequently there is a need to adjust budgets throughout the year to get a realistic view of performance to date. However, end of year reviews look at original budgets as well as adjustments in order to improve the planning process for next year. If you do not have a marketing plan, with no goals and targets or strategies to guide you, the chances of accomplishing an increase in profitability are at best haphazard. If on the other hand you do have a marketing plan with definite goals and action plans then you have a very reasonable expectation that the results will be achieved. DTA Marketing would be delighted to assist you prepare and implement your marketing plan. Call Marc on 0862555702 to enquire about how we can assist you. Choose 3 words to describe what you do – benefits driven (not services provided) that can go on business cards / proposals / brand / signage. A key benefit is that all staff have the same message when presenting to prospects. This is an opportunity to send a message to all contacts (in every email) completely free. Use the space under your logo and address to give a message – pillars, services, special offers, news or even a motivational quote. It is very prudent to ask your customers for feedback and by communicating with them you are keeping in touch and perhaps reminding them of the services or products you provide. A few simple rating question and some open questions could trigger a call to you for advice or a purchase! Use www.surveymonkey.com or www.mailchimp.com which are free. An electronic newsletter is a very efficient and effective way of communicating to all current as well as past customers. Do collect and keep email addresses and make sure you get permission from new contacts to keep in touch. A few non promotional items and informative news will ensure it is read. Printing brochures can be expensive. Have a PowerPoint presentation ready to show potential customers on your laptop. Use pictures / images of your business, quotes from delighted customers, logos of customers, key features of your website (use screen grabs), show videos – if hosted on your website use the links, close with benefits and USP’s – tell them why to buy from you. All staff can use the same presentation. Use both sides of your business card – reverse for benefits / “Pillars” / services/ product range. A 3 fold DL brochure can be designed and printed at a very reasonable rate Use opened page – page 4 – to highlight the benefits. Images and photos are important. Use your own staff in the flyers rather than stock photos. Testimonial quotes are very powerful. Sometimes a PDF can be hosted on your website. It may be possible to get coverage in local papers or radio at no cost. However it will take time and effort as you will need to devise interesting and challenging stories with interesting headings to get noticed. Always include a well taken or professional photo. Less promotional and more factual stories will get you coverage. People always look at the pictures! Spend time devising a catchy and interesting headline. Generally it is a modest cost to attend. Bring business cards or brochure (3 fold DL idea as fit in jacket pocket or handbag. Do “butterfly” about the room and don’t get stuck! Avoid customers, colleagues and friends until afterwards. Get the attendance list if possible. Have some targets for the event – collect cards, distribute your brochure, meet a specific person, reintroduce yourself etc. Plan to follow up with interesting people you have met – copy of article, reference for great website and do follow up. Connect on LinkedIn the next day. Ask them can you send them your newsletter. No cost to post but very time consuming. You may need to set limits for yourself and colleagues as time slips away. LinkedIn ideal for networking, finding targets, promoting the business and demonstrating expertise with posts. Facebook suits consumer products. Policy / strategy needs to be clear in advance for staff (and yourself) otherwise time is wasted. SM is growing in usage but it keeps changing and therefore its value to a business must be constantly monitored.